2016-2-16: This will change as I contacted mr. Wangermann from Renak. I had 2 phone conversations which were quite interesting. 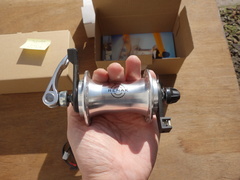 I will first tell this: I ordered a standard production version, but mr. Wangermann will also send me a test hub, of the kind that he rides himself for further development, in case there is a decision to continue with a newly engineered production run. For this decision, I will place some questions on this page, and you can write me your views/answers, such as if you'd like a disc brake version, 32h (instead of 36h), etc. The experimental hub uses not 3 planetary gears but 2 (ca. 15 instead of 22.5 rotations of the dynamo compared to the wheel), and stronger magnets. All in all this makes the new version silent, but it gives a bit less power than required by StVZO/TA (so less than 3W at 6V using a resistor, but it could always be approved with the StVZO/DIN standard...). This in itself is not a problem, as for example Sanyo's NH-H27 hub is also not StVZO/TA approved, but that is not noticeable in practice. The only cases where I did notice is with the small wheel dynamos (SD-8/SV-8), when running them in a bigger wheel than they were intended for (622mm rim). This is equivalent to a 1.8W dynamo, far less than the Sanyo NH-H27, but worse is that this comes with the low frequency power output customary to non-geared dynamo hubs, and this gives the electronics of headlamps problems at low speed, and that is what I noticed: No light at low speeds for the first 30 m at 5-7 km/h on the path from my house... It will be interesting to see what happens at low speeds with both Renak hubs. 1. Longevity: In practice the hubs last a very long time, at least as long as any other dynamo hub including from Schmidt, and water ingress is far less of a problem than with bigger dynamo hubs such as from SP and Schmidt (the older PD-7 and the SON28, not the SON28-new), which we both agreed would likely be because the Renak hub is smaller, which means less volume of air inside, and less air that will get sucked in in case of temperature differences (with the newer SP 8 and 9 series and the SON-28-new this is less of an issue I think as they are not that much different in size from the Renak, though perhaps the amount of air inside is more, I don't know about that). The exchange of air happens strongly when taking a bike from inside the house to outside on a cold day, and it happens a little bit from natural variations in the air outside. If the air inside the hub is hot, and then the hub cools down to the outside temperature, then the air inside the hub contracts, and air from outside, possibly with a lot of water if it is misty or rainy, will get pulled into the hub. 4. And then efficiency will increase to a lot more than 50%, because of the fewer gears (and because of stronger magnets?). I got the 2 hubs on 27-2-2016. The standard version is 399g, almost the same as the PD-8/PV-8 and in size they don't differ that much either. The Renak has a bit nicer look, like a standard non-dynamo hub. I will spoke it in soon. I put it in my bike loose to operate the lever as it wasn't possible to switch the hub just loose, and I find the force to operate the lever quite high, but, it's better than with the PD-7 because there you need to put your hand in a specific position to operate it with the required force, here you just push down or pull upward. But I'd like to see it work with a lever mechanism that requires less force. 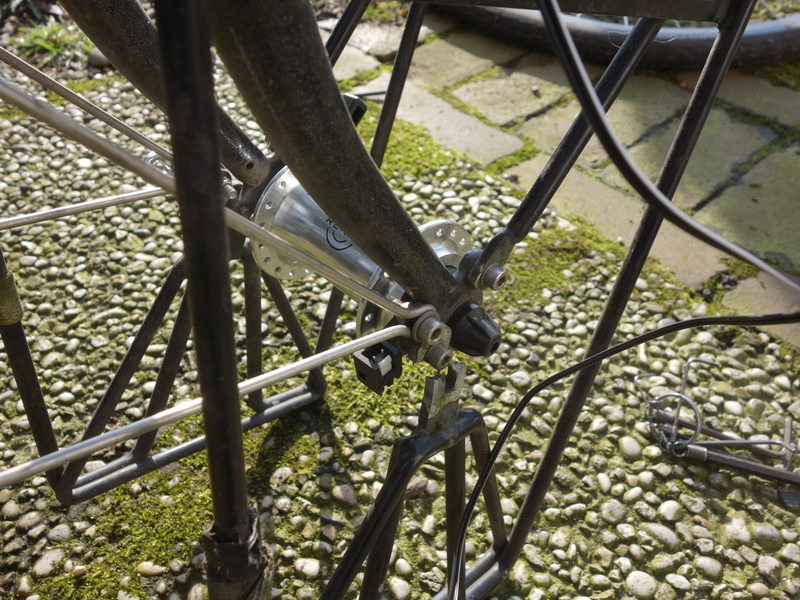 I needed to fix the quick release very tightly otherwise the hub would rotate when operating the lever, but, this is necessary with dynamo hubs anyway... The switching gives a clear pop/click feel and sound, it's like a tumble switch. 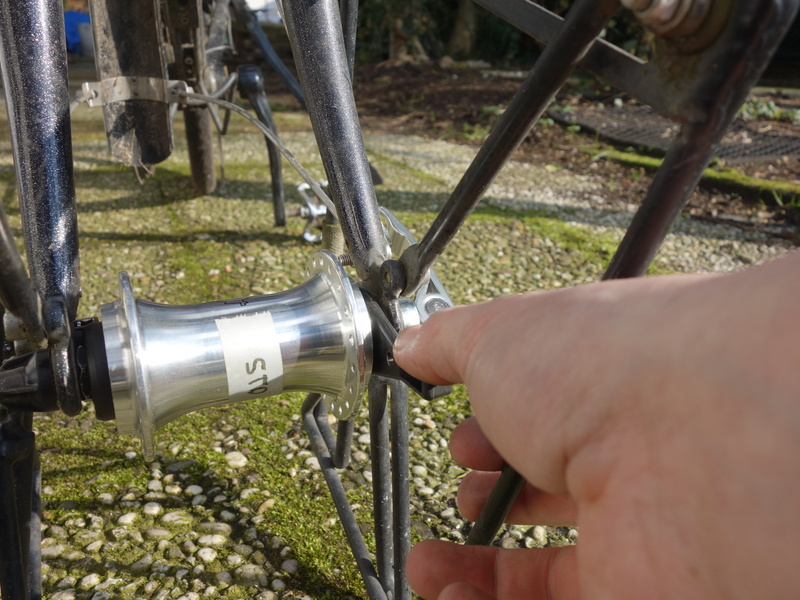 When the dynamo is engaged the hub rotates not so easily, but not really different from gearless dynamo hubs which have far stronger resistance points. The connector: This is not a downside to me, I like these connectors. I know such plugs from tinkering with electronics, they give a secure fix, and if you want you can take these plugs apart again. I have done that many times in the past when reusing various such plugs. You just press down the small prong that keeps the plug from going out backward, and pull... You might then need to push it back up again if you push too much to get it out, but generally this works well. If you solder in the wires instead of pressing the metal plugs onto the wire, you can easily replace the wires again. Of course, you need to be able to solder. 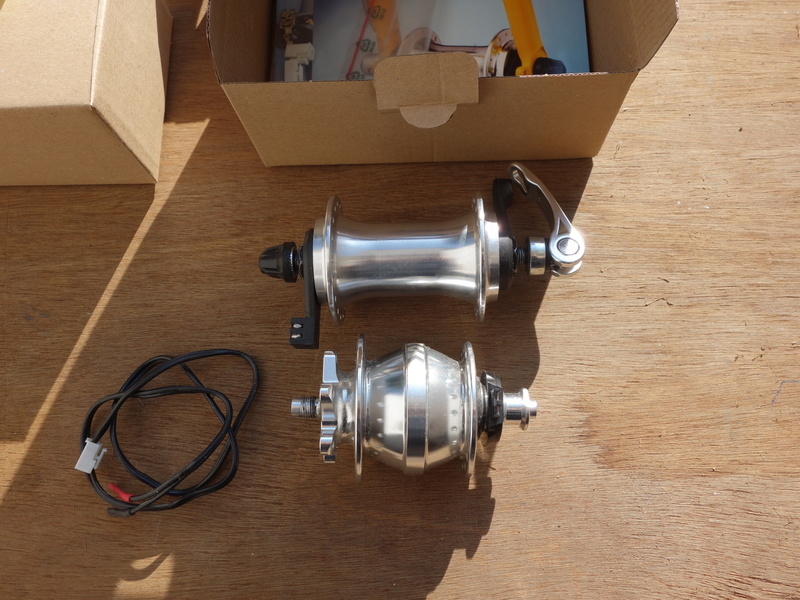 But the method used by Shimano, SP, Sanyo, to me always looked and felt rather poor. Note that Schmidt uses 4.8mm plugs which are also either soldered or pressed, so not any different in how to handle it than with the Enparlite. But 4.8mm plugs are hard to get off the hub, I prefer Renak's plugs. While riding the noise wasn't too bad, typical gear noise, slightly less noise than the Velogical rim dynamo. I was thinking during this ride about who this hub and the velogical are suitable for, and I feel both target the same audience: Riders who want light but may not ride in darkness as often as I do. For touring bikes (long tours each day, riding in the dark only when it's unavoidable) both are excellent, as there are zero losses with dynamo off, and with dynamo on both still have a good efficiency (not much less than the top gearless hub dynamos). The noise very noticeably changed to a far less loud noise from time to time making me think that the clutch didn't work fully (but the amount of light from the LS906 didn't change), or that perhaps the clutch is like a freewheel, in that the dynamo can run faster so that when you decelerate the dynamo runs but is not driven and the gears don't make noise, or less. But there was no proper correlation of noise change with speed change, it happened not just when going slower, and anyway, dynamo speed if there was a freewheel type thing in there should come down very quickly, so I don't understand yet what caused this. When it was quieter it was perfect, when it was noisier, it was OK but I'd prefer less noise. I tested at various speeds, noise increases with speed similar to the Velogical. I will ask Mr. Wangermann about this change of noise, as I don't want to open up the hub, yet! 2016-3-14: This evening, riding with both Renak hubs, I found that the LS906 switches beams. Sometimes there is barely a difference, but with the Renak experimental somehow I got it a few times into quite a low intensity mode. Perhaps this was the cause for very little light with the standard Renak hub the past night (but lower power use from the headlamp is not the reason for less noise from the hub, I checked this by switching off the IQ-X headlamp on a later ride while riding). The LS906 that I have is clearly unreliable and I will from now on ride with the IQ-X and other headlamps to further review/investigate the Renak hubs. 2016-3-16: I had another ride this night and nearly no slipping of the hub... Then this morning I had another talk with mr. Wangermann: The clutch can indeed slip at first, it needs a little time to get settled in. There are other options for a clutch (where slipping is not possible), but mr. Wangermann chose this type that can slip, in case of sudden decelerations to protect the gears. This didn't surprise me, I had already thought about it and I feel it surely wouldn't be needed for the experimental version. Another option for a future version clutch would be conical, which would require less force. Then regarding power output and noise: That there is less noise can be caused from the bearings and contact on one side. In any event, my experiences show that it is possible to have a silent hub, with gears and with higher power than the experimental Renak... Also regarding tools to service the hub, there is a possibility of shops doing hub disassembly/service, but the tools to take out the bearings would need to be made in numbers then. The experimental version weighs 405g. To be spoked in soon. I will do the StVZO power output test with resistors and a True-RMS multimeter to see how much power it generates at 15 km/h and what the effective voltage is at that speed. 2016-3-13: I spoked in the hub. Then the night of 13-14 March I made a testride and found that the LS906 gives no light until about 10 km/h. This is worse than the SD-8 with the Saferide 60 or Edelux. I will test this hub with the Saferide 60 for comparison. The wheel rotates very smoothly when turning by hand, almost seems as if there is no dynamo in it. But power is noticeably lower, not just at low speed, at 18km/h or so I felt the LS906 was still far too dark. There is almost no noise, I only notice a slight noise from the gears going back and forth at very low speed (less than 4 km/h) or reversing. This is good and for this hub I don't see the point of a clutch... I feel that this hub does not provide enough power (for my purposes). If only it would deliver the standard 3W it would be fantastic. I will report my findings to mr. Wangermann, then update this page. 2016-3-14: This evening, riding with both Renak hubs, I found that the LS906 switches beams. Sometimes there is barely a difference, but with the Renak-experimental somehow I got it a few times into quite a low intensity mode. Perhaps this was the cause for very little light with the standard Renak hub the past night (but lower power use from the headlamp is not the reason for less noise from the hub, I checked this by switching off the IQ-X headlamp on a later ride while riding). The LS906 that I have is clearly unreliable and I will from now on ride with the IQ-X and other headlamps to further review/investigate the Renak hubs. To come, see already a bit on what other measurements I did and what sort of devices I've used to measure here. The purpose of this questionnaire is to give Mr. Wangermann from Renak a view of what customers would like, so I will send him the totals of spoke holes, colours, brake options etc. and the combinations and your comments for him to decide on a future version. 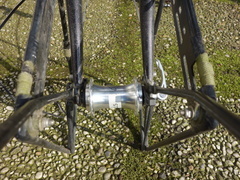 - for rim brake, IS 6 bolt disc brake, centre lock? - do you mind the noise from gears? - do you want high power output or just enough for a LED light system to light up your path? The rest of the page is from 2010-2014, with interesting background information and a user report. These hubs are available directly from Renak. Note about old versions of this hub: There were reports (by now many years ago) of the Enparlite being unreliable: In some versions of the Enparlite, the gear could become damaged (from wear, or at high speed? ), but from reading a bit more, these problems with the Renak Enparlite seem to stem from experimental production runs from a high volume manufacturer, being sold by them as if they were the final product. The ties with this manufacturer have apparently been severed and the Enparlite, other than that bad batch, seems to be a handmade low volume product again that's still being made. See for more on this issue of reliability: http://www.utopia-velo.de/UT_Mess.a4d?Nr=13454&Code=forum (in German). User serviceable: I was told that some special tools are needed to remove the entire innards. I will talk more about this after my review of the hubs. A big thanks to Martin Dupont for providing his detailed experiences and thoughts about the Renak Enparlite and for allowing me to post them here! - No drag when clutch is not engaged. - Very compact and unconspicuous hub-dynamo: At first sight most people think that it is some kind of standard hub (it helps prevent theft). 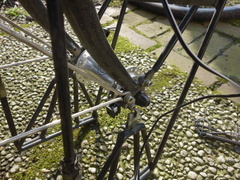 - If necessary, inner parts can be replaced without any need to unlace the hub shell. Some tool and some mechanical know-how is needed though (I slightly damaged my hub when attempting to open it). - Low efficiency when clutch is engaged (comparable with a bottle dynamo). - Noisy when clutch is engaged. This is no problem in urban environment but is annoying when attempting to enjoy hearing or observing wildlife at night in the countryside. - Clutch lever is hard to operate. As far as I know, this issue has been addressed and solved in the year 2005 but some older units remained in stock. I received mine in December 2007! - Small, non standard electric connector that is not meant to be reused if the electric cable has to be replaced for some reason. Competitors like Schmidt (standard Faston connectors) or Shimano (re-usable connector) are better. - Gears are subject to wear. So far mine are still O.K. though. My friend who owns another Renak Enparlite unit has no problem either. 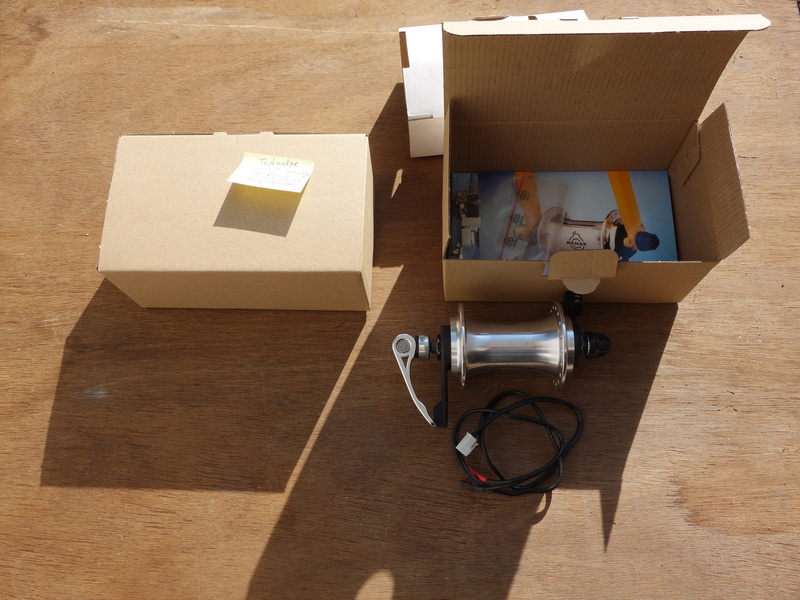 - Although the manufacturer says it would be O.K., I do not recommend using that dynamo with small wheels because its gears would wear faster, noise would be louder, efficiency would be worse. 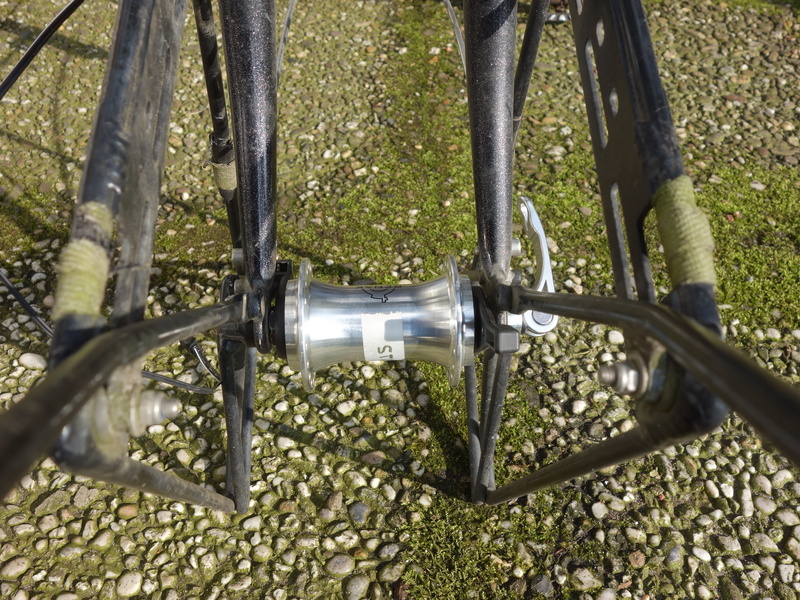 Besides, as far as I know the Renak Enparlite hub-dynamo is available only in 36-spokes version, i.e. not best for small wheels.